The year 2019 is looking like a fresh start for the country's solar power industry after the latest power development plan (PDP) for 2018-37 sought to attract more participation from private companies. Under the new PDP, solar power generation is set to open up licence granting for a total of 10,000 megawatts from the Energy Regulatory Commission (ERC) over the next two decades. This new power generation capacity from solar excludes the allocation of 2,725MW for floating hydro-solar hybrid projects at nine dams. Of that total, 2,000MW will go to the state-run Electricity Generating Authority of Thailand (Egat) and the rest to private companies. The Solar Eur Arthorn scheme was initiated by the government in 2005 to provide 120-watt solar panels for 203,000 upcountry communities that the state's power transmission could not reach. After completing that scheme, the government has been banking on the solar power industry since 2006 in a bid to encourage participation of private companies in this renewable energy. But this promotion is still being regulated by the ERC and the market competition has yet to open up. It means each property owner can install solar panels for personal consumption, but selling the electricity is open to private companies only and they have to be granted licences, as the power generators from the ERC and the power output must be sold back to the state's grids only. Private companies can sell the solar electricity to others if they are granted licences as power producers, according to the ERC's regulations. 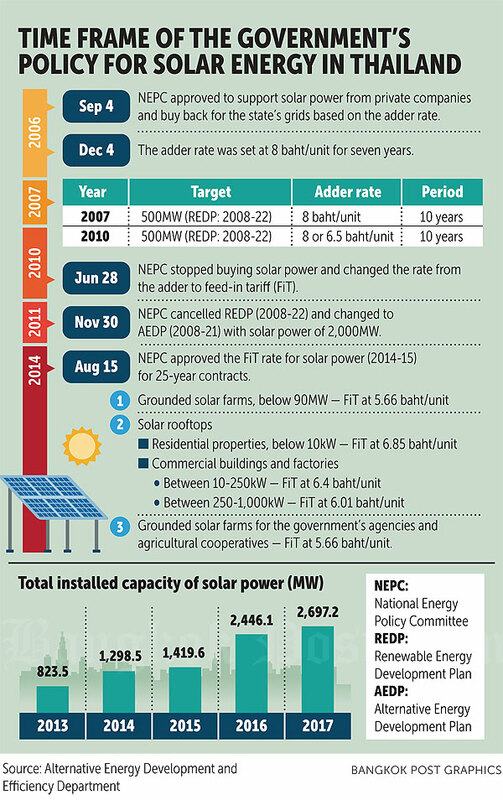 In the last decade, the government has altered its policies such as subsidies with the high power purchasing rate (adder at 8 baht per unit), changing its long-term plans and cutting the rate of the feed-in tariff (FiT) (6.5 or 8 baht per unit). The solar power industry suspended the promotion in 2015 because the power tariff is higher than that of fossil-based power, and this tariff has attracted many private companies to join the scheme. 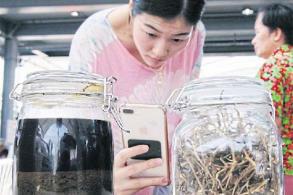 Both adder and FiT rates have pressured the power bills of Thai consumers. The latest policy is the new FiT rate for renewable power purchasing at 2.44 baht per kilowatt-hour (unit), and solar power is included. The combined capacity of 10,000MW through 2037 is expected to go on stream under the Solar Prachachon programme. The public has paid close attention to developments of this solar programme, which lets households sell back their surplus power output to state utilities. The programme will let households sell power under a business-to-business model. This means solar power is becoming a mainstream renewable energy that is targeted at 30% of the country's power generation, following other renewable resources like biomass and waste-to-energy. Kulit Sombatsiri, permanent secretary of the Energy Ministry, said the new PDP version will be implemented in the first half of the year, including solar power initiatives. The PDP also sets a time frame for fossil-based power (coal and natural gas), as well as renewable energy. 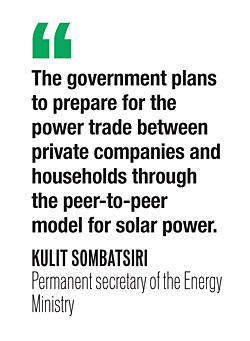 "In 2019, the government plans to prepare for the power trade between private companies and households through the peer-to-peer model for solar power," Mr Kulit said. He said the government will draw up new regulations to facilitate the peer-to-peer model as the upcoming trend, because it's confident that the cost of solar power will be more competitive in relation to fossil-based power. Mr Kulit said the government is studying how to facilitate the peer-to-peer model, such as a wheeling charge or a power rate charge on transmission lines. It is open to new proposals from private companies that have pilot projects for power trading among communities. The ERC aims to study new details of 100MW in the first half of 2019 and extend capacity in the future until reaching the 10,000MW quota. The agency will allocate the solar power, mainly for households. Narupat Amornkosit, secretary-general of the ERC, said the new details will be drawn up within two months and concluded by June after getting the cabinet's approval. "The operators will sell the electricity from solar panels in late 2019," she said. The ERC has set the FiT rate at 1.6-1.8 baht per unit, and two state-run agencies, the Provincial Electricity Authority (PEA) and the Metropolitan Electricity Authority (MEA), will buy surplus output. 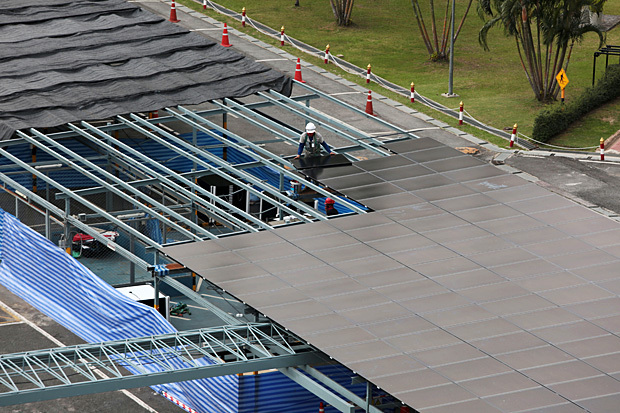 Dusit Kruangam, chairman of the Thai Photovoltaic Industries Association, said the group is supporting the government's solar policy of 10,000MW. "The trend of solar power will play a bigger role for households and private companies, and rooftop panels will play a greater role in this industry," he said. Under the new solar power plan, independent power supplies (IPS) or companies that own their power generation are expected to raise power capacity significantly from 4,000MW as of 2018. Most IPS operators are solar and biomass generators. The association expects IPS operators to increase the power capacity by a further 1,000MW because generation cost is falling. 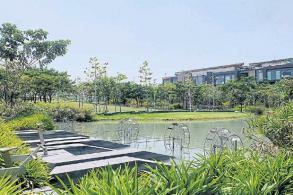 "This projection excludes solar for households," Mr Dusit said. Suvit Toraninpanich, secretary-general of the renewable energy industry club, said the average investment cost of solar panels has declined from 125 million baht per MW six years ago to 25 million. 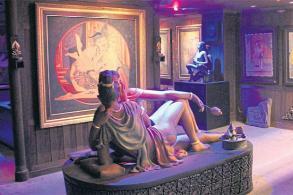 The club is part of the Federation of Thai Industries. 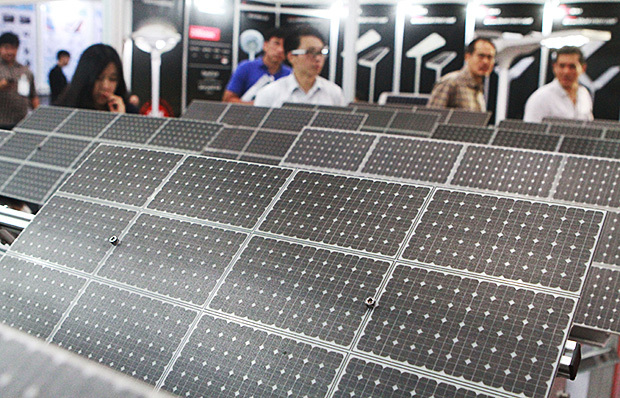 Mr Suvit said the energy storage cost from lithium-ion batteries has also dropped from US$250-300 to $100 per unit. BCPG Plc, the renewable energy business arm of Bangchak Corporation Plc, has collaborated with Australia's Power Ledger to set up pilot peer-to-peer trading in T77, a residential and commercial area in Bangkok's Sukhumvit Soi 77. T77 is undergoing testing as BCPG seeks to understand the needs of those in the community and hopes they will become clients of BCPG's peer-to-peer power trade. This model involves deregulation to support electricity generation by communities and private power purchase agreements. Bundit Sapianchai, president and chief executive of BCPG Plc, said the lithium-ion battery will reach a breakthrough level in the next three years and will disrupt fossil-based energy.